I was pouring a cup of coffee when my friend called. She asked if I had a minute to talk and when I answered, “Yes,” her resolve quickly faded and she began to cry. She told me about a conflict with her newly adopted son. Despite her best intentions, she was convinced she had failed to handle it well. 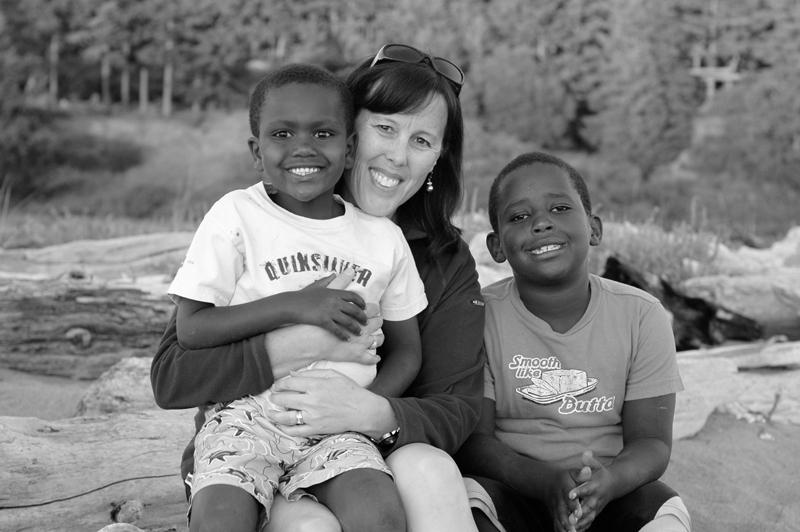 When Russ and I embarked on our adoption journey, we did it with some sense of confidence. We were experienced parents with seven healthy, and reasonably happy kids. We wanted to serve God and, since we were in the thick of raising children, it made sense to expand our parenting to include children who needed families. Besides, we really loved kids and it brought us joy to consider adding more to our family. I had been a mother for nineteen years – long enough to have made loads of mistakes, and overcome many obstacles. I was nowhere near being a perfect mother, but I was a good mom and pretty confident that my skills, my desire to live for Jesus, and my heart for children would carry me through any challenges that would come our way. Before we arrived home from Ethiopia with our new children, we knew that our lives had shifted in a dramatic way and we were in for a struggle. Jesus is merciful, however, and we only saw the very tip of a large iceberg. As the months passed and we struggled to parent our children, our belief in ourselves as “good parents” began to fade. *Should we press on with parenting techniques that have served us well for so many years? *In the face of so many challenges, which problems should we focus on first? *Is it okay to accept behaviors we’ve never allowed in our home before? *Should we read more books on adoption? *Should we stay quiet and hope that nobody will notice we’re falling apart? We didn’t know the answers, but one thing we did know: we were no longer the parents we used to be and as all of our children struggled, we no longer felt like “good parents” at all. It’s painful for me to admit, but the struggles I had with one of my children reduced me to a person I did not even recognize. My heart, which had once been so tender, was quickly hardening as I attempted to hold my family together. I had thoughts that were so foreign to me that I could not even confess them to my husband. I wanted to escape this life we had willingly chosen, which made the guilt even greater. My identity of being a “good mom” was stripped from me as I struggled simply to get through each hour. The day finally came when we sought professional help for our family and had to trust others to help us find our way. Hope was planted in our hearts and we have not looked back. As we travel the long and winding road of healing, I’ve had to redefine what I believe a “good mom” is. I accept that because I fiercely love all of my children, I must parent them differently. We aren’t the women we used to be, but we are the women God is calling us to become. He is shaping us through trial and triumph. He is calling us to lay down our lives for the sake of our children and in doing so, I pray that He is making us more like Him. I've uttered this so many time over the past three years. The commiseration of so many (especially you) has brought me out of the depths and into finding comfort in my new self-image. I may never again live up to what I thought was a good mom, but I'm not a more loving, compassionate and engaged person in the world and I understand God a whole lot more. I used to think I could be a good mom. Because of the enormous amount of attention and therapeutic parenting T needs, he is going to be my one and only — there was a time when we thought we would bring a brother or sister home, but not any more. There are days I feel cheated out of the "real" mommy experience — the one where your child is attached to you without you having to fight for it. There, I just said it. Out loud. I find your posts so comforting because hey, if you–who did the good mom thing for 19 years–struggle, then I guess it's not just that I'm incompetent at this job. It's that this job is Really Difficult. Thank you for your honesty in this article. I can so relate to your feelings and experiences. I never thought I could have all of the dark thoughts that I have had at times over the years while parenting children from hard places. As Moms, we need to band together and support one another through the hard times, with honesty and prayer and understanding. Thank you so much for pouring your humanity out to us! Even though my situation is different (I used to be a good nurse/friend/daughter) it so helps me to read your writings. Blessings upon you! You have no idea how much I needed this post today. I just finished talking to the professionals who might be able to help us with our little one. You've written words that my soul identifies with so deeply that I cannot express my gratitude in words. The tears that come along with finally feeling that someone knows what you're going through are so cleansing. I'm in the process of finding a support group. Thank you for your transparency! You blessed me today. When we brought home our 3 children from Ghana, we already had 10 bio. children and I had been a mother for 23 years. Yes. I thought I was a "pretty good mom". We, too, knew before we left Ghana that we were in for some type of journey that we had never imagined in our worst nightmares. It was a bit scary . . . but we trusted that the Lord would guide us. And, He has. Thanks for sharing. It is always a blessing to know that others have walked this walk before us. Amen. Amen. Amen. You speak as though you perfectly know my hearts thoughts. If you want to be refined in the Makers fire, adoption of a hurting child will take you there faster than anything I know. Rejoicing and trusting along with you that He is making a beautiful vessel out of our lives!! One of the things I love about your blog is that you give beautiful words to so many things I have thought and felt….and this post is no different…it really resonates and I (once again) find myself choking back tears as I read. Wow! Lisa. If you did not just put my life into words Exactly! I don't know what! Everything you wrote today was my life, my situation, my struggles and tears. I miss the Martha Stewart days. The Betty Crocker dinners and rainbows and unicorns. I'm now a Walmart screaming Mom. My own Mom just asked me this weekend. "Isn't this so much better?" I miss my fantasy world. I loved the matching outfits and cookie cutter life. But I absolutely LOVE my new blessing more. I love equally that we DON'T match. That our love is stronger than blood and years of bonding. I love that God fills in our gaps and is even more present in our lives now. Thank you for your writing. It is so nice to know I am not alone. I sobbed uncontrollably – still am – as I read your post…… I could have written it. (Scary similar to me – from the 7 children that my husband and I had before adopting and felt so good about parenting…. to turning into something I didn't even recognize.) Thank you for your raw honesty. I am still trying to get back my "good mom" feelings, and the smallest set back is a huge blow to that progress. Now I pray to God to remind me that I used to LOVE children, and pray that by the time grandchildren arrive I will be healed and open to loving again. I remember this. You spoke of this in Nashville, TN, at the Empowered to Connect conference. I remember this. I didn't think it applied to me. Now, as I sit here in my bed with the stomach flu and unable to go far from my bathroom, doing research and reading blogs, I read yours. And I am encouraged, as I have been recently attacked by people "who care" about how I raise my children from hard places. I am also saddened again, as we are in another transitional place that is so very hard. I wasn't a mom before we brought home our oldest, so I'm not like you in that. I had no mothering experience. Yet, I thought of myself as a good mom. No one–NO ONE–prepared us for what was next. No one told us about trauma, attachment disorder, SPD, ADHD, etc. We didn't know. We didn't know. And now..we hurt. We hurt badly. I miss what you described, as I thought that was what we would have. We are older parents of young children. We thought we would do sports, music, art, or whatever, bake cookies, have family nights, play outside and play games in the winter. Go camping, fishing, and on vacations. We now know that we have to let many of those things go. Not all the time, of course, but we have to weigh so many things before we can consider doing anything. I long for my time with my husband…I long for my time with Jesus that I didn't have to fit in between the watchful hours of 2-4am when my son wanders the house to see what he can do to get into trouble. I miss my son. I miss who God is creating him to be. Yet. He is MY son. My beloved son. He has a good heart. He loves Jesus. He just doesn't know how to love…me. When I was fostering three little ones in addition to my own two littles, I said those words all too often! And then I'd think I was crazy, and must have idealized how I was "before." But then they left, and suddenly I was a good mom again. The perspective has taught me a very powerful lesson that I need to ask for help when I'm in over my head! Thank you Lisa! Encouraging to know your not alone in your emotions/feelings! Becoming with you! This is my story … with the small exception that we were in the counselor's office in month 3 of being home. My older kids have seen a mom they didn't know existed, and I pray that they remember the happy, calm mom that they once had. I pray that some day we will all look back and see the refining and the good that came from it. Right now it all just a little too ugly to have perspective. Thank you for always being honest and transparent. It help more than you might imagine. My pastor gave me some counsel that has been like life to me. He reminded me that the goal of Christian parenting is that God be glorified in, and through me, as I parent in difficitul situations. My goal is not that my children grow up to be contributing members of society, stay out of trouble, etc., or even that my children become believers. Their outcome is in God's hands and, ultimately, not under my control anyway. My goal is to glorify him, not to turn out "good" kids! Aaaah, his yoke is easy and his burden is light when I'm not trying to carry around the yoke of outcomes! I know you posted this comment a long time ago and I may be writing to " no one " as time may have changed your address ….but your comment( via your pastor ) has helped me immensely today . It was sent from God right to me . Melanie, I'm so glad you are helped and encouraged by this post. It is still such a powerful theme in my life. Thank you for commenting. Thank you. I really really really really (etc.) needed this. COMPLETELY get this and it goes right along with what I have been reading the book Parenting the Hurt Child!! It is so much comfort and encouragement to know there are those "out there" who understand!! Thank you, everyone, for your comments. I wanted to reply to every single one, but can't quite get to it. I'm so glad this post resonates with you – although our lives and families are all different, there are some commonalities as we parent our children from "hard places". Wow. Until I started reading this blog, I had never really thought about what it's like to adopt. You guys (I mean ALL of you who have adopted children) face a lot of the problems we have faced with having a special needs son – except of course they are for different reasons. Our son has autism and especially when he was younger he appeared to have no real attachment to us. His behaviour often made life difficult to say the least. When I read your comments about hardening your heart, and just trying to get through life an hour at a time, not being the mom you planned to be – well they all ring true with me. It's not just hard, it's VERY hard. I'm so glad that you have this place where you can all find out you're not alone. This article rings true not only for me …but I had my husband read it as well . He grieves the "good dad " he used to be . We too , had no idea the road we were going to travel when we adopted from Eastern Europe 11 years ago . How blessed we were to read your article Lisa and know we are not alone . Our children watch home videos of us before we adopted and added such stress in our home . They comment on how HAPPY and carefree mom and dad used to be . Sigh …hard to hear ! We know that God has a purpose and we believe if nothing else , if our daughter accepts Christ and we spend an eternity with her in heaven , it will all have been worth it ! Such eloquent words. It's been 13 years since our adoption of 3 siblings and it's still hard. Not as devastatingly, overwhelmingly hard, but still tough. We are estranged from the oldest because she went to RTC and never worked to come home. We still parent her 2 siblings, both now attached but one with tremendous difficulties still. I know God has used them to refine me, but it has been through heartbreaking obedience, one step at a time. Thanks for sharing your heart. 2 years ago I didn't understand. I do now. It's been almost exactly 2 years since we got our boys… *sniff* You spoke my heart, thank you, Lisa! Wow. A friend shared your post. It's like reading my life. 16 years of parenting, 8 years of adoptive parenting. Nothing prepares you for it. Most agencies do a really poor job of telling APs of what may be down the road. We've used 3 agencies for 4 of our adoptions, an additional 2 were private adoptions from disruptions. We've experienced the memories of who we used to be. We think about adopting again. It's a call we've answered and might surely answer again for without it our oldest would surely have been an only child. I miss the simpler easier times, but it was also a lonely time for our family, one filled with despair of not being able to have that 2nd child. The good has definitely outweighed the bad for us. To be the same mom I was 16 years ago, well, I don't want to be her. I want to be who I am today: stronger, wiser, more compassionate, more aware. It's like what someone above said about only seeing the tip of the iceberg…your eyes get opened wider as the days go on. Blessings to you and to all these other parents that have taken the step forward to love a child. Thank you so much for your beautiful words. Just this morning I was with a friend and we were talking about how we have been changed through our experiences as adoptive mothers. We aren't the women we used to be, our families are not the same, but the Lord is doing a good work in all of us. Blessings to you. I never thought about changing my old parenting style. It makes me crazy when they worked before and they don't now. Thank you for the enlighting thoughts. I also thought I was the only one that had these dark thoughts and regrets. Our family has gone thru hell and back a few times in the past three years. It doesn't seem to stop. I'm just now at the place to seek help. I hate that I'm not the mom I use to be and it hurts so deeply when mt bio kids (we have 5 ) tell me they want their mom back. I know she's down there somewhere. I was a mom for 23 years before we adopted. I am now a grandma and scared that I won't be the grandma I dreamed to be. Thank you for you telling your story. I'm looking forward to healing in our family. There are so many of us trying to find ourselves in the midst of a new life, and a family that has changed. You're right, she's still there. I hope you find healing for your family. My heart goes out to all of you who struggle to raise challenged children. I have none myself, but have worked in the mental health field with kiddos as well as adults for 21 years. Many days are draining but I remind myself that you deal with it 24 hours a day, 365 days a year FOR YEARS, for as long as you live. There are so many to assist who will not allow it or cannot allow it due to their issues. Again, my heart goes also to those who love these individuals. I do not know how you do it. Please know that those of you who struggle with the mental health system are understood. I struggle with it daily……but I stay because I feel it is where I am supposed to be. I long for the old days when we offered more services that insurance companies will no longer cover! I struggle with co-workers who do not “get it” and judge! I have been repremanded for “crossing the line” to advocate for children when their parent/s have just as many issues as the child and are unable to stand up for them! I struggle with the fact that the medical area of our hospital looks pristine with the all the latest EVERYTHING, and the psychiatric area goes without in MOST areas! I struggle with the insurance companies who grant so few days of coverage! I struggle with politicians who do not fight hard enough for psychiatric needs! I struggle with communities who continue to look away as though our individuals are less than! I REALLY struggle with those who feel that individuals with mental issues “should just get over it, work harder at it”. Please know that I feel you all are God’s angels on earth. I pray for each and every one of you who hang in there to do the best you can. YOU ARE LOVE in it’s purest form, even when you struggle. Thank you for your kind and encouraging words, Vicki. Claire, I’m glad you reached out. Is there anyone you can talk with near you? A friend or a counselor? Have you joined an online group like the Facebook group Parenting with Connection? It’s so important not to be isolated in our shame. You are not the worst mother in the world – you are loved.